An exclusive service ideal for a London or '70s themed wedding or just to be different. 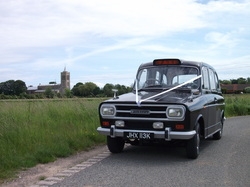 This very rare 1971 Winchester London taxi is one of just 54 built of which only 2 remain on the road. She completed over 12 years of London service before passing into preservation.